Today, 100 gigabytes of RAM-disk can be purchased for as little as $100,000 and can deliver access times 6,000 times faster than traditional disk devices. By 2015, a gigabyte of RAM is projected to cost the same as a gigabyte of disk today, which is approximately $200. RAM I/O bandwidth is projected to grow one bit every 18 months, making 128 bit architecture due in about 2015 according to the data in Table 12.1. The fact that RAM does not get faster means that CPU speed continues to outpace memory speed. This means that RAM sub-systems must be localized close to the processors to keep the CPUs running at full capacity, and this architecture impacts Oracle performance. 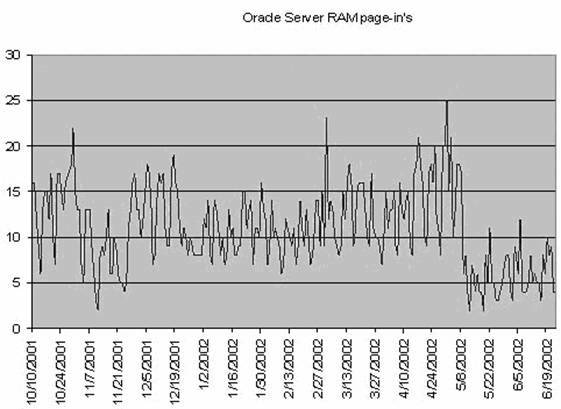 Traditionally, the Oracle DBA measured RAM page-in operations to judge RAM utilization on the database server as shown in Figure 12.5. All virtual memory servers (VM) anticipate RAM shortages and asynchronously page-out RAM frames in case the RAM is required for an upcoming task. When the real RAM on the server is exceeded, the OS will overlay the RAM and must then page-in the saved memory frames from the swap disk on the Oracle server. However, measuring RAM usage based solely on page-ins is a mistake, because the page-ins are a normal part of program start-up. To be effective as an Oracle metric, the page-in operations (from vmstat, glance) must be correlated with the OS scan rate. When an Oracle server begins to run low on RAM, the page-stealing daemon process awakens and UNIX begins to treat the RAM memory as a sharable resource by moving memory frames to the swap disk with paging operations. In most UNIX and Linux implementations, the page-stealing daemon operates in two modes. When the real RAM capacity is exceeded, the page-stealing daemon will steal small chunks of least recently used RAM memory from a program. If RAM resource demands continue to increase beyond the real capacity of the Oracle server, the daemon escalates and begins to page-out entire programs’ RAM regions. Unfortunately, on Linux kernel 2.6 users have no control over it. Every parameter available for tuning kernel has been taken away from the system administrators. Because of this, it is not always clear if the page-in operations are normal housekeeping or a serious memory shortage unless the activity of the page-stealing daemon is correlated with the page-in output. Paging occurs in kernel mode. Generally speaking, if the system exhibits more than 10% of kernel mode CPU usage, for a prolonged period of time, there is a problem with paging. To aid in measuring real page-ins, the UNIX and Linux vmstat utility yields the scan rate (sr) column which designates the memory page scan rate. If the scan rate rises steadily, the page-stealing daemon's first threshold will be identified, indicating that that particular program’s entire RAM memory regions are being paged-out to the swap disk. This behavior can then be correlated with the vmstat page-in (pi) metric. The following is an example from a vmstat output. The spike in the scan rate immediately precedes an increase in page-in operations. Fortunately, the AWR can be used to track these important external server metrics.